Each month Oxford Economics’ team of 160 economists updates its baseline forecast for 200 countries using the Global Economic Model, the only fully integrated economic forecasting framework of its kind. 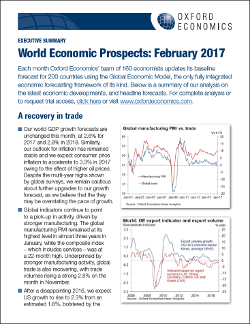 Below is a summary of our analysis on the latest economic developments, and headline forecasts. Our world GDP growth forecasts are unchanged this month, at 2.6% for 2017 and 2.9% in 2018. Similarly, our outlook for inflation has remained stable and we expect consumer price inflation to accelerate to 3.3% in 2017 owing to the effect of higher oil prices. Despite the multi-year highs shown by global surveys, we remain cautious about further upgrades to our growth forecast, as we believe that the they may be overstating the pace of growth. Click here to download a free executive summary of February's healine forecast. If you are already a subscriber, click here for the full report.